If you exist on the internet at all as a teacher, you know that one-pagers are all the rage right now. It makes sense. They’re easy to differentiate, they’re fairly easy for students to understand, and they’re fairly easy for the teacher to grade also. I’ve see many examples online, and I’ve used them on occasion in my classroom myself. Still, I’ve noticed that some of these one-pagers assignments have been more about their attractiveness, and less about getting students to think and synthesize the material from their unit of study. This doesn’t have to be the case. 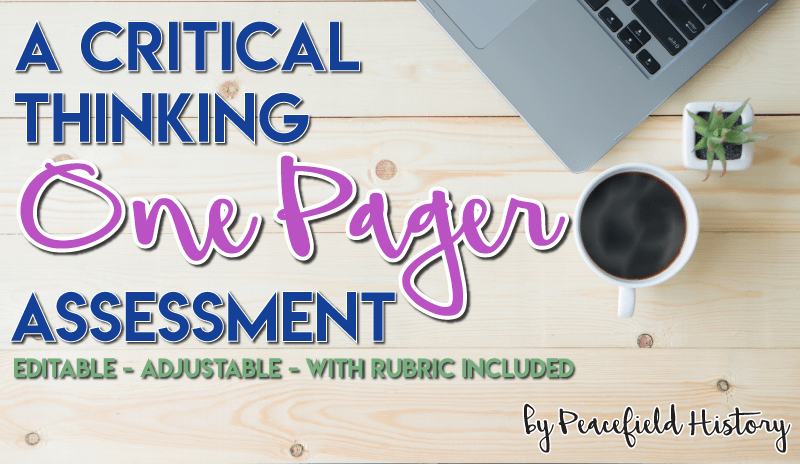 One-pagers can and should assess critical thinking. Therefore, I decided to make an easily adaptable, critical thinking one-pager. Each option has students formulate their one page around an essential or compelling question. Any information they collect on the page is targeted towards supporting that compelling question. For middle school students, you might give them the question as the teacher. High school students can generate their own question. I have three different versions. One is for U.S. or World History, one is for Ancient History, and the last is a more generic version for high school. I’ve also included a rubric that assesses a student’s mastery in their answer of the question. You can see a partial sample below. Would you like your own copy for editing and implementing? It’s easy, simply click on the link below. You’ll also be signed up for my weekly (ish) newsletter. My newsletter includes my musings, ideas, and reflections about teaching History. Just click here to grab your copy!